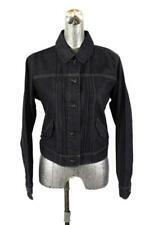 Beautiful Salvatore Ferragamo Jacket in black wool. Size IT 42 (designer size). 100% wool (see details on the picture). One button front closure, 4 small buttons on each sleeve, front pockets. Perfect for formal occasion, for business, or with jeans. Unique stitching details on the front as pictured. Gently used, great condition (please see pictures of the close up). Closet clear out, everything must go! Offers considered! Let me know if you have any questions. IN A BROWN PINSTRIPE WOOL. ARMPIT TO ARMPIT 19". FLORAL PRINT LINING. SHOULDER TO SHOULDER 15". LENGTH 25". Beautiful soft and warm Mohair and Wool. Lovely Autumn colours. Length from back of neck to hem 42.5”. Arm length 21.5” (shoulder tip to cuff). UK estimated size: 10. Label size: 44. Flaws (any shown in last photo / photos). Very Minor flaws - Insignificant on wearing. Nothing significant ✓. Very Good ✓. Shoulder pads. Pockets ✓. Bought in September 2015 and never worn. Size IT 44. Inner 100% silk. 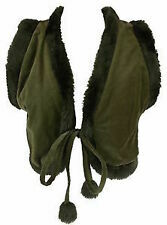 Mink fur origin: Denmark. Material: Fur. Category: Clothing. Size: 44 IT, 12 UK. Location:United Kingdom. Pale grey gillet with popper fastening and collar. The colour is pale grey, the photographs on the mannequin are a little dark, apologies. Item does require a dry clean just to refresh. 40% Off . 20% Off . 50% Off . 30% Off . Wholesale Lots. Bomber style very good condition genuine jacket. label said size 40 would fit 10 UK. outer 100% leather. shoulder to hem 21". Armpit to armpit across 18". underarm to hem 13". shoulder seem to cuff hem 24". Made from the softest, highest quality Nappa Leather in Black it is enhanced with the beautiful buttons and small layers of ribbon that run across the jacket from front to back. Made by one of the best leather houses in the world, the detailing and quality of this jacket is amazing. Collared with lapels. Fabric: 100% Linen. Long length sleeves. Length: 25.5". Weight: 640g. Lower pockets. Underarm to underarm: 19.5". 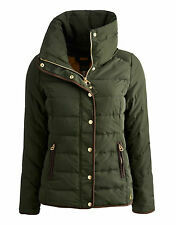 Ladies lightweight jacket -coat ,can be worn as single or double breasted. Length 65cm. Would fit sizes 10-12-14UK. Very good condition! The front panel is silk and sleeves and the back are a fine wool. Worn very rarely. 100% Original! Size: IT42; UK10. Flap pockets. Black trim to collar, down centre front, hemline & cuffs. Long length sleeves. Length: 40.5". Note; this is a used item, therefore despite our inspection process there may be minor imperfections. Beautiful coat by Salvatore Ferragamo. In a black gancini jacquard fabric, poly cotton mix with polyeurothane so it's showerproof (not rain proof). Lined with black logo lining. Leather trim to under collar and cuffs. Three gold tone stamped gancini metal fastenings to front, two flap pockets to front. Mac style coat slightly cocoon shaped. Sized as a US 6 which is a uk 10, suggested fit for a uk 10 or 10/12. Shown on my mannequin which is a uk 8/10 and it was approx a size large though with a big jumper it could also fit smaller, however please check measurements provided in pictures against a siilar style coat which fits you well. Although there are no obvious signs of alteration, this coat came from a high end lot of an estate auction for a petite lady and most of the clothing had been altered to fit a petite height of 5ft3. Button fastenings through front. Flap pockets. Made in Italy. 100% Leather Lining: 100% Polyester. Closet Upgrade Specialises in Pre-Owned Designer Clothing and Accessories at Bargain Prices! Size 46 IT / 14 UK. New listingBrand New Labelled Salvatore Ferragamo Leather & Suede Jacket Size 44/12 Super. This cost £2159 and the labels are still attached. It’s super soft and stunning. No pictures can describe how beautiful and luxurious this jacket is. Salvatore Ferragamo Brown Jacket. UK 14, IT 46 or Eur 42. UK 14, IT 46 or Eur 42. Made like cotton net with structured leaves hanging over the fabric.Lining-100% silk. Belt-cotton net with leather inside.Fastening-one hook on the waist level.Can be worn with or without belt. Outer-96 % cotton,4% polyester. Wool lined. I would say would fit a size 8 to 10. Made in Italy. Type: Blazer Jacket. Material: Wool. Colour: Beige. Label Size: IT 40 Small. The lining is made from 100% silk. Freperie is old French for 'Frippery' and my oh my do we love our fancy, frivolous frocks. Any defects will be identified. The jacket has been worn, but still in an excellent condition, well cared for. 24", 60cm length from back collar to bottom. Size: IT40; US6; F38; D36; UK10. Mannequin is a UK10. Lining: 100% Rayon. This jacket is in good pre-owned condition. Made In Italy. Long length sleeves. Dogtooth pattern. Size: 42; UK12. Lower pockets. Good Pre-Owned Condition. Weight: 260g. Length: 28.5". Button front fastening three buttons construction pockets on front. Fabric: Wool. We'll do everything possible to solve any problems. Country of origin: Italy. Shoulder 17" | Sleeve 20" | Chest 17" | Waist 16" | Hip N/A | Full Length 20". The Freperie. Any defects will be identified. Important Notes. Size & Fit. RRP £1200 - £2000. Fastens with three buttons down the front. Simply lovely jacket. A pre-owned item in very good condition. The top button has been chipped slightly. Freperie is old French for 'Frippery' and my oh my do we love our fancy, frivolous frocks. About The Freperie. Any defects will be identified. UK size : 8. Two outside pockets. USA size : 6. Lightweight leather shell in a beautiful sage green. Supple leather with top stitching. two horizontal slash pockets. COLOR - Sage Green. PIT TO PIT - 20" (at widest point, when buttoned). point / spread collar. Size : 44 ITA /10 US. THE LENGTH OF THE JACKET. My knowledge of the authenticity of things that I constantly improve! 100% AUTHENTIC. ARMPIT TO ARMPIT - 50 cm. And often disappear. FROM ARMPIT. SLEEVE LENGTH. It has long sleeves and a snap front closure. 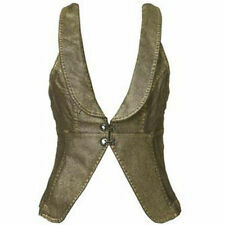 It has a pointed collar and features tan kid skin leather trim and details. This jacket is an Italian size 44, which would best fit a United States size 8 to 10. Fur Type Fox. - 100% Real Fox fur/ultra-soft leather. Accents Fur Trim. 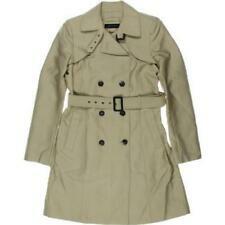 Style Trench Coat. - hidden buttons and leather belt closure. Material Leather. - 19" (48cm) waist. Color Silver. Model: KNIT JACKET CARDIGAN. AB Many scratches and stains but still no problem to use. 100% AUTHENTIC. Colour / Size: Black, S. Model Number: N/A. S Nearly new. B Used a lot. Noticeable scratches and marks. Classic tailored type Elegant and easy to match beige color. color beige. We are not able to mark the item as 'gifts'. P.O box correspondence. ※It fluctuates by weight and size. We 100% gurantee. About Authenticity. I think that Shearling type is toscana. Real Leather. (A)Lenght 70 cm. at the level of a stomach 42 cm. (D)shoulder to cuff 61 cm. Color appearance may vary depending on your monitor settings. Color Coral. Fur Type Lapin. UPC Does not apply. Size Type Regular. MADE IN ITALY. TWO SIDE FRONTAL POCKETS. Style Softshell. SNAP BUTTON CLOSURE. Model: TWEED LONG COAT WITH BELT. AB Many scratches and stains but still no problem to use. 100% AUTHENTIC. Colour / Size: Black x White, 42. Model Number: N/A. S Nearly new. NS Like new or Display only. Designer: Salvatore Ferragamo Condition: Excellent! Color: Brown Content: Real Leather Lined: Yes Made In: Italy Size: US 8, IT 42 Bust: 37" Waist: 32" Hips: 38" Sleeve: 26" Shoulder to Shoulder: 16" Length: 24". Wool Blend. -Brown satin lining. MPN Non applicabile. EAN Non applicabile. Colore principale Marrone. Made in Italy. Knitwear / Shirts / Jackets / Coats / Dresses. Composition: Wool. Each item is unique and awaits a faithful owner. Look after it carefully and add a piece of history to your wardrobe. Size:38 Color:Woolwhite Overall length:about 57 cm Chest:about 45 cm Sleeve Length:approximately 54.